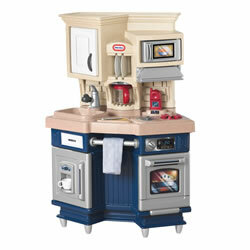 Allow creativity to soar with Kaplan's large collection of realistic kitchen sets and accessories. Kaplan provides entire kitchen sets as well as individual pieces, such as stoves, sinks, refrigerators, cupboards, and dishwashers. 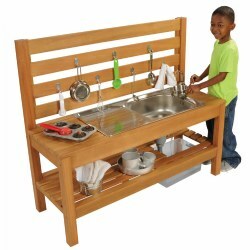 Made of solid wood, durable laminates, or heavy-duty plastics, our kitchen sets and kitchen islands withstand consistent play. With our accompanying play food and cookware, children in your classroom can let their imaginations roam as they engage in dramatic play. 3 years & up. This compact kitchen has many modern features. Includes cabinet and refrigerator doors that open with storage inside, clicker knob and burner with electronic cooking sounds, faux stainless steel appliances, coffee pot, frying pan, phone, dishes, and eating utensils for two. Assembly required. Requires 2 AAA batteries (not included). Made in the USA. 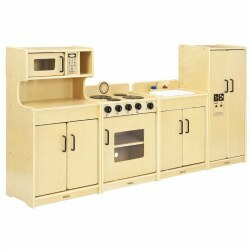 Assembled kitchen size: 4''L x 28''W x 40''H. 3 years & up. Faux granite countertops and faux stainless steel appliances along with plenty of surface and prep areas makes this feel just like a real "at home" kitchen. There is a place to pull up a chair and enjoy a meal and a variety of fun accessories for cooking. Includes oven, microwave, refrigerator with working doors, electronic stove burners with cooking sounds and plenty of cabinets for storage. Assembly required. Requires 2 AA batteries (not included). Made in the USA. 2 years & up. Lots of storage, walk-around design, ample counter space, sink with tub and stove with modern cook top make up this classic kitchen. 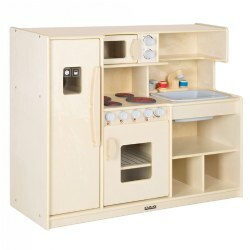 Sized just right for toddler's first kitchen. Some assembly required. Measures 20"H (to countertop) x 27"W x 24"D.
Classic Maple kitchen consists of a refrigerator, sink, and range with microwave. Features include: faux stainless doors on Maple colored laminate with honey colored accent, microwave included over the stove top, smooth stove top with two "hot" burners, clicking knobs, real faucet, refrigerator with 3 shelves and ice and water dispenser decal, and 24" countertop. Minor assembly required. Accessories sold separately. 2 years & up. Sleek and modern, this kitchen features a working oven, clicking knobs, electronic cooking sounds and plenty of storage and counter space for making healthy meals. Cappuccino maker and lots of accessories add to the creative and imaginary role play. Requires 2 AA batteries, not included. Assembly required. Measures 13 1/2"W x 46 1/4"H x 38 1/2"L.
2 years & up. 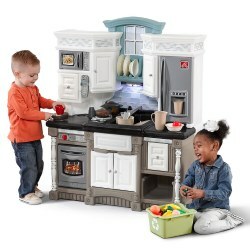 Encourage dramatic play with a kitchen sized just for toddlers! Birch hardwood construction with easy-to-clean laminate tops. Dishes and accessories not included. Some assembly required. 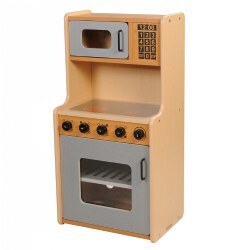 Classic Maple Range/Microwave features faux stainless doors on Maple colored laminate with honey colored accents, smooth stove top with two "hot" burners, and clicking knobs. Minor assembly required. Measures 41 1/2"H x 21"W x 15"D. Due to these discounted prices we cannot offer our standard warranty. All Sales Final - No Returns or Refunds. Limited Quantity! 2 years & up. 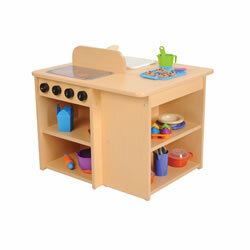 The rich, buttery tones of this North American solid maple kitchen set invite toddlers into a world of dramatic play. Available separately or in a set of 3. 3 years & up. 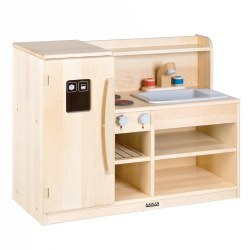 This one piece birch kitchen unit encourages dramatic play. The space saving design is ideal for any classroom! Measures 38"H x 48"W x 15"D.
Order up! 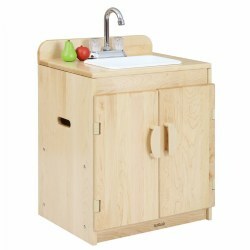 Create an inspiring learning environment in your classroom with an attractive, durable, child-safe birch plywood dramatic play kitchen. 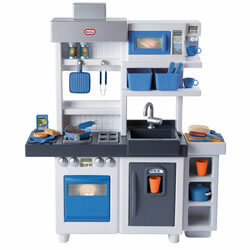 This Toddler All-in-One Kitchen set is the perfect place to help toddlers navigate their way around the kitchen and cook up their favorite foods in a compact dramatic play station. 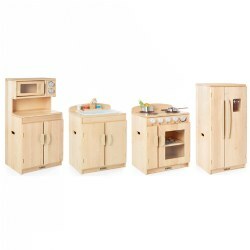 Inspire young chefs to create in a beautiful, long-lasting birch plywood kitchen. 18'' countertop height. Lifetime warranty. Enhance stability and eliminate potential pinch points of the connected Premium Solid Maple kitchen units with this easy-to-use linking system. Simply slide the frame between two units and screw the plastic pieces in place. 2 years & up. 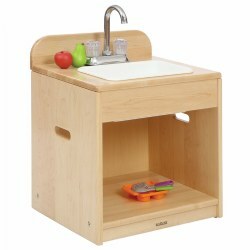 A smaller version of our modern, attractive play kitchen unit combination sink and cabinet. Designed with a removable plastic tub sink inset in the top, plus a real faucet and turning knobs. Under sink compartment offers plenty of space for storage of kitchen pots and pans, play food, and more. 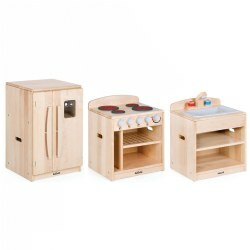 Easily connects to other units in the Premium Solid Maple Toddler kitchen set. Measures 25 3/8"H x 18"W x 15"D. Contents not included. 2 years & up. 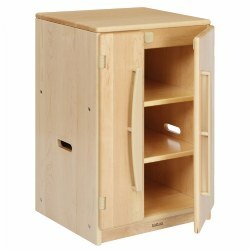 Enhance stability and eliminate potential pinch points of the connected toddler Premium Solid Maple kitchen units with this easy-to-use linking system. Simply slide the frame between two units and screw the plastic pieces in place. 2 years & up. 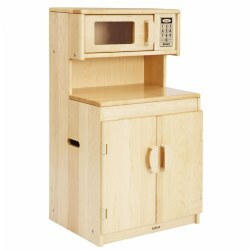 A smaller version of our modern, attractive play kitchen unit refrigerator. Doors open with realistic easy to hold handles molded to be grasped from either side, and swing on pinch-free hinges. 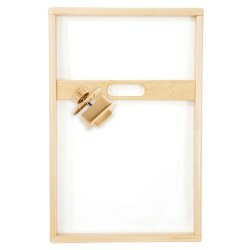 Recessed magnetic closure keeps doors closed safely with no need for latches.Easily connects to other units in the Premium Solid Maple Toddler kitchen set. Measures 28"H x 18"W x 15"D.
3 years & up. 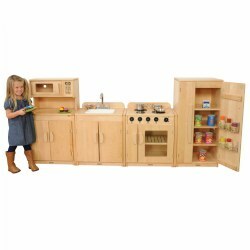 This one piece North American maple kitchen invites children into a world of dramatic play. 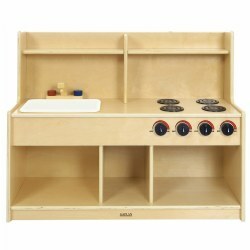 The rich, buttery tones of this unit warm up any dramatic play area. Measures 38"H x 48"W x 15"D.
18 months & up. 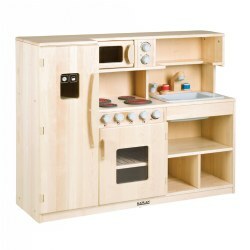 Complete with stove, sink, and refrigerator, this modern, space-saving Toddler All in One Kitchen features all the kitchen staples a child would need in a consolidated dramatic play station. Measures 28"H x 36"W x 26"D.
3 years & up. Includes four kitchen units, microwave cupboard, sink, stove, refrigerator, and three Linking Systems. Constructed of Maple hardwoods. 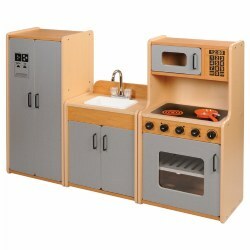 Features: sink has a real faucet, stove burners have "red hot" accents and clicking knobs, and the side-by side refrigerator has a water dispenser decal. Minor assembly required. 2 years & up. 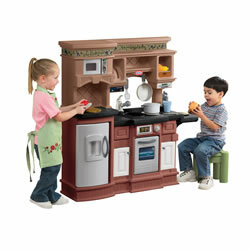 An efficiency kitchen with all the features for toddlers to pretend and play to their hearts content. Features four knobs and burners cook top, oven with shelf, sink with faucet along with a shelf above to keep kitchen supplies close at hand. Solid birch construction and measures 28"H x 36"W x 13"D.